Once one of Africa’s largest bodies of fresh water, Lake Chad is disappearing fast. Climate change has shifted the rainfall patterns that once reliably fed the lake, and coupled with uncontrolled irrigation, the lake has shrunk by 90% since the 1960s. Lake Chad is an important source of water and food for millions of people in Nigeria, Cameroon, Niger, and Chad. According to the UN Food and Agricultural Organization (FAO), the lake has seen a 60% decline in fish production, and the quality of the surrounding land has declined, reducing livestock production and biodiversity. The story of Lake Chad’s water woes echoes throughout the surrounding Sahel region and the rest of Africa. Soil degradation and massive losses of rainwater from fields through evaporation are contributing to large yield gaps in crop production. But experiments with water-harvesting techniques and careful fertilisation in countries such as Kenya, Tanzania, Burkina Faso, Niger, and Ethiopia have demonstrated an untapped potential to more than double agricultural output of smallholder farmers in some cases.1 1. Barron, J., 2009. Rainwater harvesting: a lifeline for human well-being. United Nations Environment Programme. Link to abstract and PDF download See all references Such solutions will be necessary to face future food and farming challenges, including climate change and land degradation. 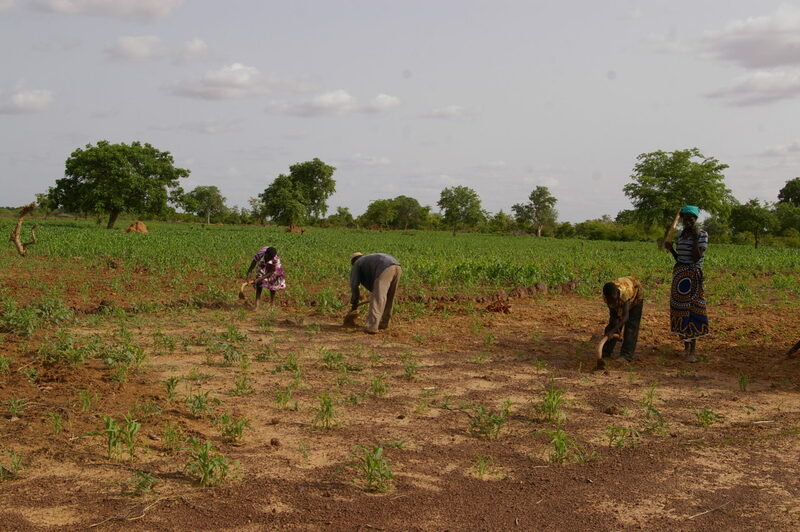 In the Sahel, small-scale farmers can no longer sustain themselves through conventional farming practices. Declining soil fertility, decreased crop productivity and yields due to climatic extremes, and decreased land access due to population pressure leave nearly 12 million small-scale farmers chronically vulnerable to food and nutrition insecurity and about a fifth of the households ultra-poor. Even in good rainfall years, many adopt harmful coping mechanisms such as taking on more debt, eating fewer daily meals, and selling their assets. Faced with such a challenge, calls for improved irrigation are understandable; however, attempts to “modernise” agriculture risk depleting water reserves unsustainably, exacerbating competition and conflict. New ways of thinking will be required that combine old wisdom with an appropriate level of artificial input. Malin Falkenmark, a senior advisor to the Stockholm International Water Institute (SIWI) and researcher at the Stockholm Resilience Centre (which publishes Rethink), has lived through the era of engineer-driven water management. She has spent most of her decades-long career showing the potential of rain-fed agriculture and the benefits it has to offer in many parts of the world. She is not impressed by the majority of development initiatives that aim to improve water availability in arid and semi-arid regions. Data from the Water Footprint Network, a non-profit multi-stakeholder collaboration between the private sector, the public sector, and individuals, show that green water represents about three-quarters of global water consumption, and even more than that for subsistence farming, where people produce food for local consumption. The Water Footprint Network established a standardised water measurement tool to measure and report on water consumption in a consistent way and to calculate not only the amount of water consumed by various businesses, but also when, where, and how it is consumed. Even losses through evaporation are accounted for, revealing the need for water conservation techniques. Using data from this tool and water requirements from the FAO, researcher Fernando Jaramillo and colleagues at the SRC are contrasting projected growing water needs with future declines in water supply due to climate change. Jaramillo notes that fulfilling Africa’s water needs will be heavily associated with dietary choices as well as competing demands from industry and future urban growth. “At the same time, urbanisation and industrialisation increase the pressure on already strained blue-water resources and raise the need for new approaches,” he says. Climate change projections are also cause for particular concern, Jaramillo says. In many areas around the equator, farmers will have to produce more with less water, in order to feed a growing population, while facing lack of reliability of rainfall. Traditional techniques, such as soil and water conservation and rainwater harvesting, are enjoying a revival worldwide in areas where irrigation is impractical. These techniques may form an important but overlooked resource that can be used to transform the agricultural sector and build resilience to be able to tackle climate change risks and growing food demands. Shrinking water reservoirs will be one problem to be faced in Africa as climate changes and population demands continue to grow. Lake Chad is shrinking fast, sparking a response that is symptomatic for the blue-water paradigm: multi-billion dollar plans have been set up to divert water from the Congo River system to “refill” the lake. A US$50 billion canal will be designed to divert up to 100 billion m3 of water per year to the lake. Lake Chad, Africa, in December 1972 (left), 1987 (middle), and 2002 (right). Once the world’s sixth largest lake, Lake Chad has shrunk about one-twentieth of the size it was in the 1960s due to drought, compounded by irrigation and other human uses. Large wetland areas, shown in red, replaced open water as the lake receded. Images from the US Geological Survey Landsat Missions Gallery, provided by NASA Global Climate Change: Vital Signs of the Planet. The US$50 billion plan for Lake Chad stands in stark contrast with a recent initiative to raise US$100 billion for building water resilience for food security and human well-being in Africa as a whole, through rainwater harvesting, storage, and other traditional techniques. The initiative was launched in 2016 at the Falkenmark Symposium held in conjunction with World Water Week, SIWI’s annual conference in Stockholm, Sweden. The symposium provides an opportunity for scientists and practitioners to address and discuss water management challenges. In an appeal taken up by symposium participants in a call for action, Falkenmark said that eradicating hunger in Africa requires nothing less than a “green-water revolution”: a “deep mind-shift” from the predominant blue (liquid) water paradigm, to an integrated green-and-blue-water paradigm that builds water resilience.6 6. SIWI, 2016. "CALL FOR AN AFRICAN WATER REVOLUTION" Outcome from the Malin Falkenmark Symposium at World Water Week in Stockholm 2016: A Triple Green Future for Humanity. Download PDF of Statement See all references The participants underscored the necessity of a shift in attitudes among public and private development funders: they want to see better coordination of public and private investments to implement small-scale farming innovations in rainwater harvesting. According to the World Bank, investments in improved rain-fed agriculture have been shown to produce four times greater yield per dollar in sub-Saharan Africa, compared to investments in mechanised, irrigated agriculture.7 7. Ward, C. S., Torquebiau, R., Xie, H., 2016. Improved agricultural water management for Africa’s drylands (English). A World Bank study. Washington, D.C.: World Bank Group. Page to download PDF See all references But large-scale irrigation is still the preferred option among leading private and public investors. According to a recent report produced by SIWI, supporting dialogues among development actors that respond to Falkenmark’s call, this can be explained by the much larger yields produced from lands that are amenable to large-scale irrigation, which attract investors by promising quick returns on investments. Much of these investments are directed towards non-food, export-targeted output, which does not improve African food self-sufficiency nor address rural poverty. New funding sources will be required, but much can be achieved by redirecting existing funding if efforts are efficiently coordinated. Major development actors are now lining up to answer Falkenmark’s call. Experts from more than 20 organisations devoted to supporting Africa’s agriculture have reiterated the need to bring the issue to the forefront of the governments’ and investors’ agendas. Their response also came in part to an invitation from Belay Begashaw, director general of the Sustainable Development Goals Center for Africa in Kigali, Rwanda, which has a mission to support governments, civil society, businesses, and academic institutions in achieving the UN Sustainable Development Goals in Africa. As former minister of agriculture in Ethiopia, Begashaw knows first-hand the struggles and complex task of reconciling the aspirations of investors with the needs of rural farmers, but also local communities’ attempts to rise from poverty through improving the output of their labour and investments. In the Sahel, such a mix of old and new thinking is proving effective. Groundswell International, a non-profit partnership focused on agriculture and food systems, has helped farmers use agroecological innovations to increase climate-resilient food production and improve dietary diversity through better management of green water. For example, the non-profit organisation has supported the expanded use of zaï pits – traditional planting methods that use green water effectively and can rehabilitate abandoned land and degraded soils. Groundswell International took a systems approach to scale up zaï pits as well as other seemingly modest methods that differ greatly from the conventional, top-down transfer of technology. This approach focuses on proven conservation agriculture methods to improve crop productivity and regenerate soils, along with a focus on scaling, equity, gender, nutrition and diets, livelihood diversity, and governance. 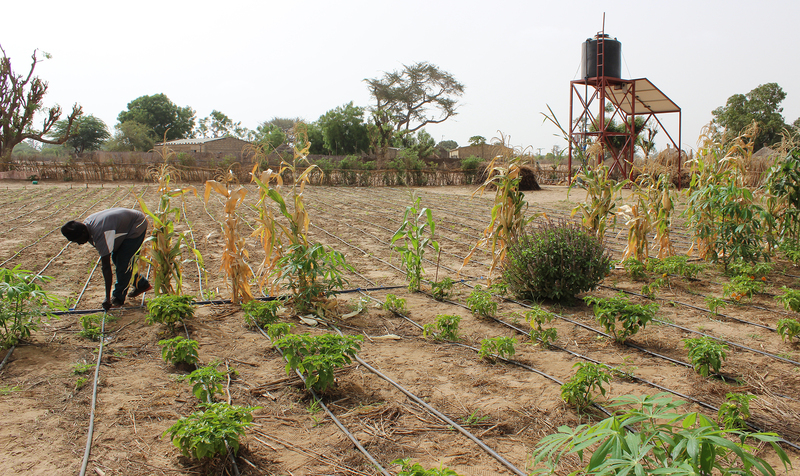 Through improved green-water management, this project has improved the resilience of over 100,000 rural farming families in the Sahel.TK-source? “Conservation agriculture methods were a traditional practice across Africa before the introduction of unsustainable intensification methods including heavy tillage and extensive fertiliser and pesticide use,” says Nathanial Matthews, programme director of the Global Resilience Partnership, which supported the work by Groundswell International. Opening image: Farmers weeding a field where zaï pits and stone bunds are used. Copyright: Hanna Sinare. 4. Jaramillo, F., Destouni, G., 2015. “Local flow regulation and irrigation raise global human water consumption and footprint”. Science. 350(6265):1248–1251. DOI: 10.1126/science.aad1010. 5. You, L., Ringler, C., Wood-Sichra, U., Robertson, R., Wood, S., Zhu, T., Nelson, G., Guo, Z. and Sun, Y., 2011. What is the irrigation potential for Africa? A combined biophysical and socioeconomic approach. Food Policy, 36(6), pp.770-782.